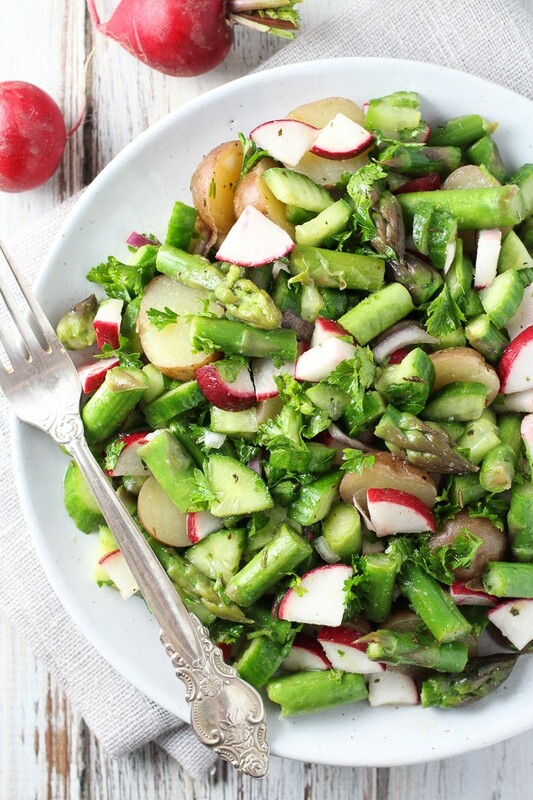 This potato salad with asparagus is crunchy and refreshing. 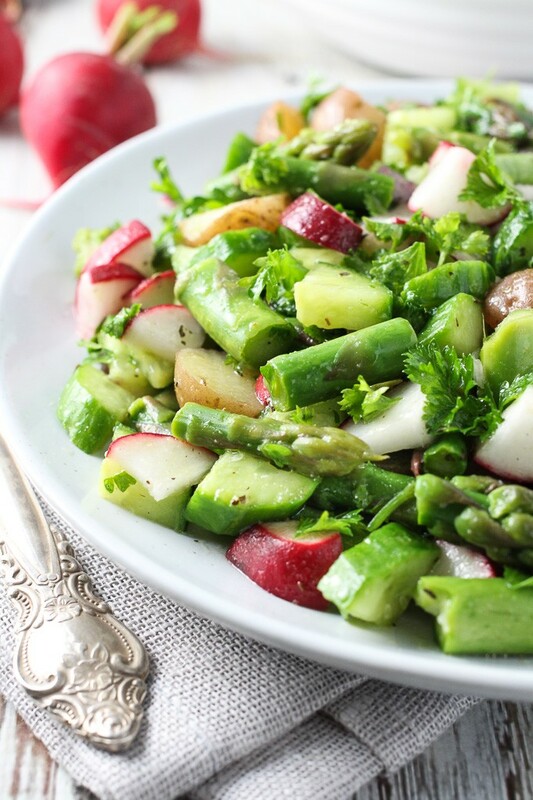 It makes a perfect addition to a light meal and can be served as a side dish or salad. We are going absolutely crazy about asparagus right now. 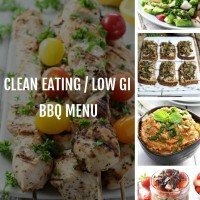 I roast it almost every day and add it to as many dishes as possible. If I only could make an asparagus based dessert I would. 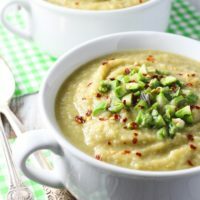 It’s really versatile – you can steam, roast or saute asparagus and use it in soups, side dishes, or salads. 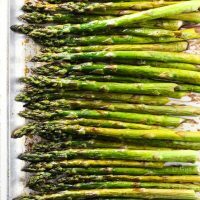 If I am planning to serve the asparagus as a side dish, I usually roast it in the oven with a bit of coconut oil and balsamic vinegar. 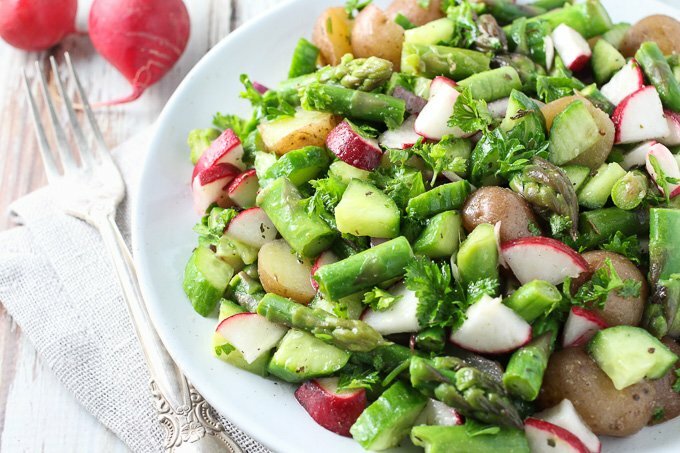 If I am adding it to a salad, I usually steam it and then transfer the steamed asparagus to a bowl of ice-cold water which helps to preserve the bright green color. Asparagus tastes best when it’s still crunchy so whichever method of cooking asparagus you choose, make sure not to over-cook it. 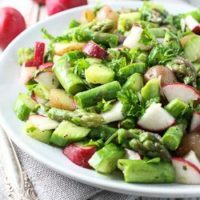 If you are looking for more easy salads that are perfect for spring, check out this Green Quinoa Salad, this Potato Salad with Avocado, and this Kale and Beet Salad. 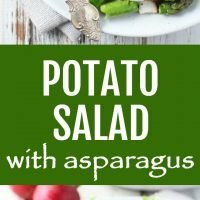 This Potato Salad with Asparagus is very healthy and easy to prepare. 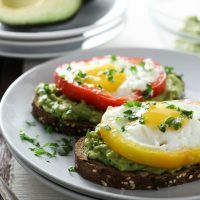 It is full of wonderful seasonal veggies and very filling. Perfect for spring and early summer. To cook the potatoes, start by rinsing them under cool running water. If needed, brush them with a vegetable brush to remove excess dirt. Place the potatoes in a medium saucepan and add cold water just enough to cover. Over medium-high heat, bring the potatoes to a boil. To steam the asparagus, place a steamer basket over the saucepan with the potatoes and add the asparagus. Cook the asparagus until it can be pierced with a fork for about 10 minutes. Then transfer the asparagus into a bowl with ice water. This helps to preserve the vibrant green color. Once the potatoes are done (usually takes 10 to 13 minutes). Carefully drain the potatoes and let them cool. Once the potatoes are cool enough to handle, cut them into halves or quarters. 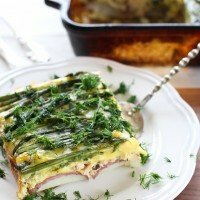 Cut the asparagus into bite-size pieces. 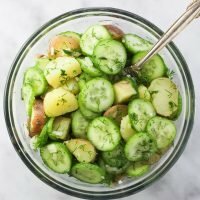 Place the potatoes, asparagus, onion, cucumbers, radishes and parsley into a big bowl. To make the dressing, add the olive oil, red wine vinegar, garlic powder, dried basil and thyme into a small bowl and whisk. Pour the dressing over the salad. Season the salad with salt and toss. 1. Nutrition information is a rough estimate for 1 of 4 servings.